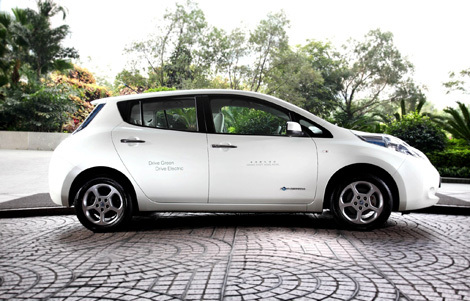 Grand Hyatt Hong Kong has unveiled its first electric car, LEAF by Nissan. This move comes after the hotel introduced its corporate responsibility programme, Hyatt Thrive, last June, with “environmental sustainability” as one of its four pillars. The LEAF is a 100-per-cent electric car that does not produce greenhouse gas emissions during operation. When fully charged, the vehicle can go for up to 160 km with a top speed of over 145km/h. Guests staying at the hotel can ride in the chauffeured green car to reach other parts of Wanchai and neighbouring business and shopping districts of Admiralty and Causeway Bay. It is a complimentary service for all staying guests, offered on a first-come-first-served basis and available from 10am to 6pm. “In addition to providing authentic hospitality, Grand Hyatt Hong Kong strives to make a difference by contributing to the community. The introduction of the green car marks a milestone in the hotel’s history by showing our corporate social responsibility to sustaining the local environment,” said Gordon Fuller, general manager of the property and Hyatt Hotels’ area vice-president. Apart from Grand Hyatt Hong Kong, Island Shangri-La also deploys the Nissan LEAF Electric, with which guests can shuttle themselves from the hotel to popular areas nearby. For more information, visit hongkong.grand.hyatt.com. For a roundup of other ways in which hotels go green, click here.